Moraiolo and frantoio olives picked on the hills between Assisi and Trevi. Only a selection of the best olives through the year are used. Excellent for dressing any dish, very delicate and particularly suited to the Mediterranean diet. 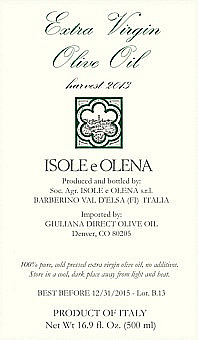 Used by more Michellin Star Chefs than any other olive oil. Truffles are one of the supreme luxuries in nature and the kitchen. Earthy and intoxicating, their distinctive fragrance has inspired culinary brilliance for centuries. But they are rare, seasonal and costly. This French-made oil captures the essence of the truffle and makes it an affordable luxury that you can enjoy year-round. Just remember, a drop goes a long way!